The extension of a spring or wire is directly proportional to the force applied provided the limit of proportionality is not exceeded. 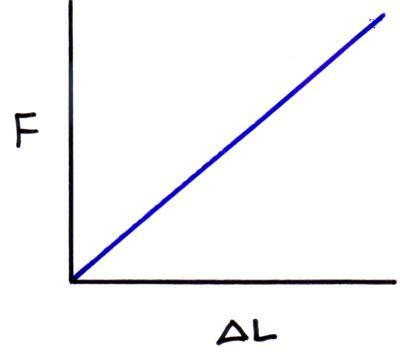 When a graph of force against extension is plotted for a material which obeys Hooke’s law it looks like the graph below. The gradient of this graph is the spring constant (k) which is measured in Nm-1. The limit of proportionality is the is the point beyond which Hooke’s law is no longer true when stretching a material. The elastic limit is the point beyond which the material you are stretching becomes permanently stretched so that the material does not return to its original length when the force is removed.